We love hot peppers and always have at least a few jalapeño plants in our garden. They’re usually our “golden crop” but didn’t do so well this year. There wasn’t anything wrong, per se, but they weren’t the prolific producers they had been in the past. The beginning of the best hot sauce I’ve had. And it’s all pretty much fresh from the garden. Anyway, Matt’s parents also had a small garden this year and planted cayenne peppers. Though I’m not quite sure why — they don’t have a particular affinity for spicy foods. They know we adore anything hot & spicy and unloaded a bunch of cayenne peppers on us. We were happy with the gift, but we were at a loss for how to use a dozen of them. A few were thrown in chili pots and used here or there for cooking. Even with that, we still had quite a few to use, along with some other jalapeños and Anaheim peppers that were starting to get wrinkly. That’s when I came upon this recipe for hot sauce. Ours is a variation because we had different peppers, but it was simple and delicious. 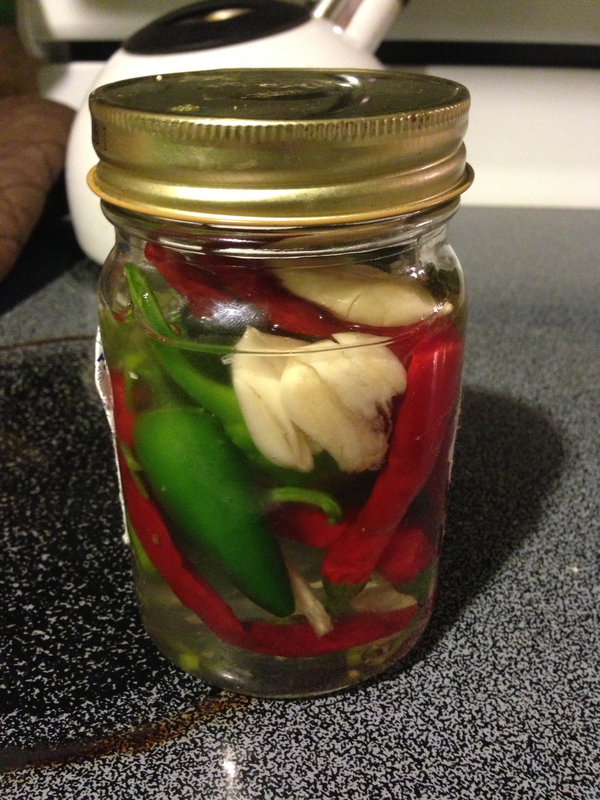 Next year, we plan on reserving one or two of our new “pots” for cayenne plants so we can make this again. So when I came home today, the gray devils were sitting on the edge of our raised beds. I figured it was not a good sign because they already dug up our lettuce earlier this year, and earlier this month I caught one red-handed feverishly searching for acorns in our potted plants. Our street is lined with big, beautiful oak trees so I know why there are so many. Don’t get me wrong, I usually adore squirrels and love watching them run around, but I despise when they invade our garden. A mixture that will repel squirrels and other critters. I hope. I did a lot of reading this weekend about controlling pests in the garden. We’ve had more than enough to deal with this year. 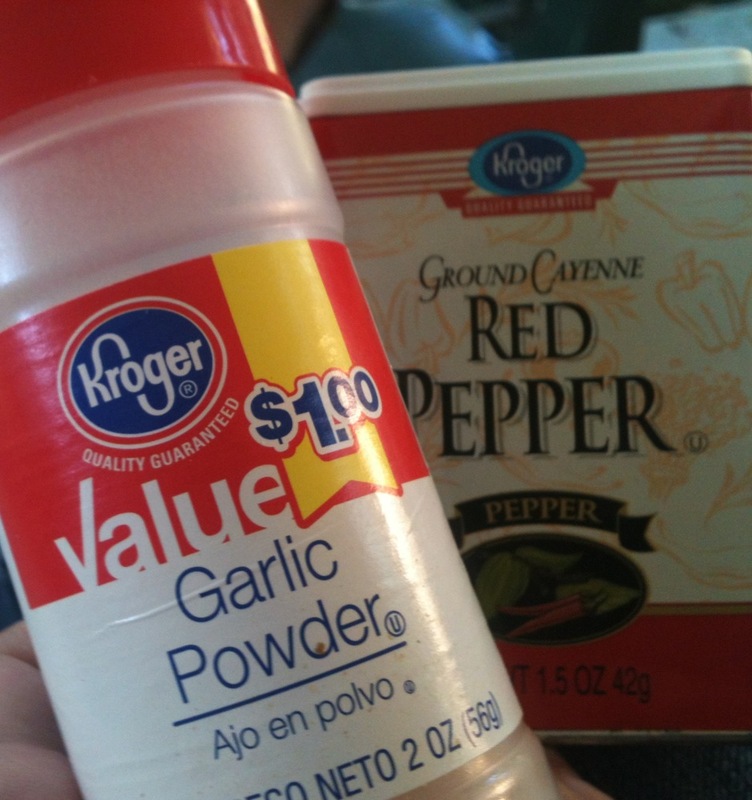 One consistent (and natural) deterrent I found was cayenne pepper and garlic. I mixed a healthy amount of garlic powder and cayenne pepper in about one gallon of water in the watering can. I don’t know how much I used because, like with my cooking, I never measure. I sprinkled the solution all around the garden and focused on the lettuce and peas, which we replanted last weekend. Keeping my fingers crossed that it works!